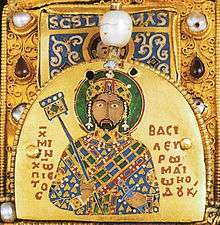 Michael VII Doukas or Dukas/Ducas (Greek: Μιχαήλ Ζ΄ Δούκας, Mikhaēl VII Doukas), nicknamed Parapinakēs (Παραπινάκης, lit. 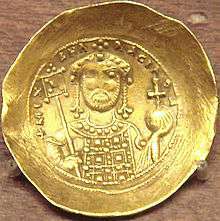 "minus a quarter", with reference to the devaluation of the Byzantine currency under his rule), was Byzantine emperor from 1071 to 1078. Before his resignation from the throne, Michael VII may have sent an embassy to Song China, following a series of Byzantine embassies to the earlier Tang Empire of China. From the Wenxian Tongkao, written by Chinese historian Ma Duanlin (1245-1322), and the History of Song it is known that the Byzantine emperor Michael VII Parapinakēs Caesar (Mie li sha ling kai sa 滅力沙靈改撒) of Fu lin (i.e. Byzantium) sent an embassy to China's Song dynasty that arrived in November 1081, during the reign of Emperor Shenzong of Song (r. 1067-1085). 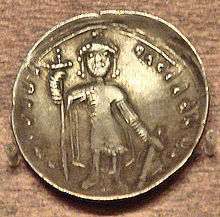 The History of Song mentions how the Byzantine diplomat and official named "Ni-si-tu-ling-si-meng-p'an" offered saddled horses, sword-blades, and real pearls as tributary gifts to the Song court. 1 2 3 Paul Halsall (2000) . Jerome S. Arkenberg, ed. "East Asian History Sourcebook: Chinese Accounts of Rome, Byzantium and the Middle East, c. 91 B.C.E. - 1643 C.E.". Fordham.edu. Fordham University. Retrieved 2016-09-10. ↑ Fuat Sezgin; Carl Ehrig-Eggert; Amawi Mazen; E. Neubauer (1996). نصوص ودراسات من مصادر صينية حول البلدان الاسلامية. Frankfurt am Main: Institut für Geschichte der Arabisch-Islamischen Wissenschaften (Institute for the History of Arabic-Islamic Science at the Johann Wolfgang Goethe University). p. 25.